Ok, folks. 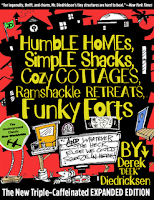 It's time for the grand tour of our, not-so-grand home. 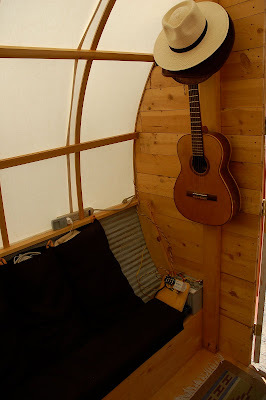 Building the wagon has been, hands down, the most challenging project we have taken on to date. It has also been the most rewarding. While many components of our home did not adhere to the original plan, the overall vision that we had for this place has been carried through in a way I thought I could only dream of. Our systems work, our stuff fits, and it fits the aesthetic we were aiming for when we began this project in March. 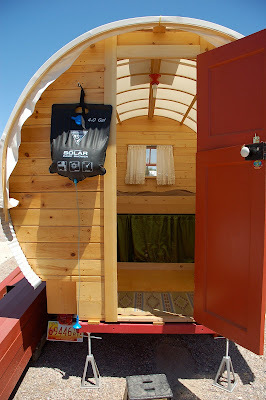 The wagon has a dutch door for cross ventilation and for fun, with antique door hardware that locks with a skeleton key. On the door side of the wagon are two large hooks that hold kerosene lanterns at night and our solar shower/dishwater during the day. The bed is raised three feet off the ground to provide under bed storage and to utilize the width of the wagon at that height. The mattress is homemade--a straw stuffed futon cover. At either end of the bed are storage pockets to hold toiletries, books, and computer stuff (you can see the pocket at right here). The under bed curtains were made by my pal Wendy at Holy Scrap Hot Springs. There are magnets in the bottom of the curtains and a steel strip behind that 1x4 which keeps the curtains in place. You can see the full layout of the wagon here as well--kitchen to the left, couch to the right, bed at the rear. The view from the bed. Hooks on either side of the door hold stuff up for us. In this photograph we are preparing to leave, so the water containers and stove have been stowed out of view. Wendy and I collaborated on this couch, with Tristan contributing some ideas. I am pretty thrilled with the way this turned out. The seat is a handmade, foam-filled cushion. The back rest has three pockets that serve a dual purpose as cushion and laundry bag. As the laundry bag fills, the couch gets more comfortable! Loops at the top affix the cushion to the wagon but make for an easy removal so the whole thing can be shlepped to the laundromat! At the right here you see our electrical equipment, which will eventually be enclosed in a cabinet/end table. For the moment it looks ugly, but at least we have power! Another view of the kitchen. 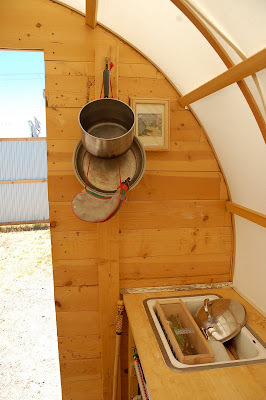 The sink is plumbed to the outside of the wagon, where a hose end can be placed into a 5-gallon water jug to hold output. Our input (the solar shower) is 4 gallons, and the jug holds 5, so we never have to worry about overflowing. The jug gets dumped daily to keep it from getting funky. I'll try to get some pictures of the rest of this system for a later post. Couch + Laundry = best idea ever. Lionshead's obversation deck. She is starting to get the hang of the cat door. The observation deck is made from scrap lumber and those wire dorm shelf cubes, secured together with hog rings. You can also see our trailer jack in this picture, which is a recent addition. The trailer jack makes it way easier to hitch and unhitch the trailer and raise it to level. It folds up and stores along the tongue when we're driving. Our 50-watt solar panel is mounted on the roof and charges the battery while we're on the road. We got a great deal on the panel at a flea market last summer. Little did we know we'd be using it to power our whole house just a year later! The only system we don't have in place yet in our wagon is a toilet. We have plans to build a composting portable toilet, but on this trip we will be relying on facilities at campgrounds for this need. Well, we've reached the end of our tour, folks. Click here to read more about how we built our tiny house, and the journey we took.